Are the Death Estimates Accurate? 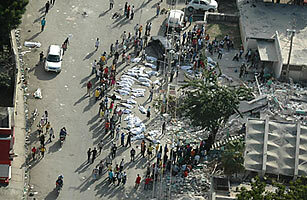 Survivors gathered around bodies in Haiti's capital Port-au-Prince. Days removed from the deadly earthquake near Port-Au-Prince, Haiti, estimates of the number killed are still wide-ranging  figures ranged as high as a half-million in the immediate aftermath of the temblor but floated downward in recent days, with the latest estimate from the Haitian government at 140,000. Experts caution that any figure should be taken with a grain of salt, as rescue workers are only now getting on the ground and recovery efforts continue across the city. But the fluctuating figures  and the inexact casualty totals from disasters past  raise the question: how will we ever know just how many people died in the Haitian quake? Any final tally will be a "guesstimate," says Anthony Penna, professor emeritus in environmental history at Northeastern University. The mass number of casualties make getting an exact body count impossible, so Penna says aid workers will bring technology to bear to fill in the gaps. Shortly after the quake, rescue workers asked Google to update the satellite imagery of Port-Au-Prince to show the devastation. Penna says rescue workers will comb for collapsed buildings, cataloguing them as dwellings, public buildings or hospitals and estimating the number killed in each. But it's digitally informed guesswork, at best. "We're still talking about some pretty broad bits of data," Penna says. Haiti also has several things working against it. The country is the poorest in the Western Hemisphere, with limited infrastructure and makeshift dwellings that make population figures shaky to begin with, disaster aside. When it's difficult to get a firm read on the number of people in a city to begin with, it's hard to determine how many were killed. And rescue efforts are a race against the clock, as survivors are at risk of developing disease like dysentery, malaria and dengue fever, stoked by the tropical climate. Penna dubs Haiti a "rolling disaster," meaning the death toll could well climb higher post-quake, adding to the estimation burden. The hope, of course, is that the tally won't be as bad as feared. Penna points to recent earthquakes in Kashmir in 2005 and China in 2009, both of which, while horrific, ultimately killed fewer people than initially thought. Why the overestimation? Penna says there's a tendency toward sensationalism in the aftermath of a disaster, in part because of incomplete information and in part to spur donations. But if nothing else, those donations bring rescue workers to the scene who help to recover the injured and help to take  as best they can  inventory of those who have died. "You're never going to have a perfect count," Penna says. "You can't." See a TIME reporter's account of the scene in Haiti. See TIME's complete Haiti earthquake coverage.